We are engaged in supplying a wide range of Polycarbonate Roofing Sheets that is best known for its high quality. These Polycarbonate Plastic Sheets are manufactured using quality raw material by using innovative technology. Our easy to install and easily transportable sheets can easily be cold curved to give shape to the vibrant imagination of architects and design professionals. Being a great alternative to glass due to its excellent heat insulation properties. These Polycarbonate Plastic Sheets are suitable for energy-efficient light transmitting constructions. 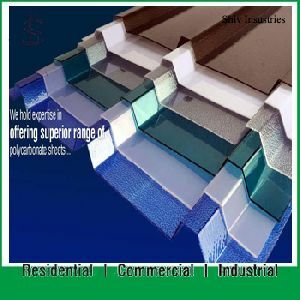 Corrugated Polycarbonate Sheets / Polycarbonate Translucent Sheet. 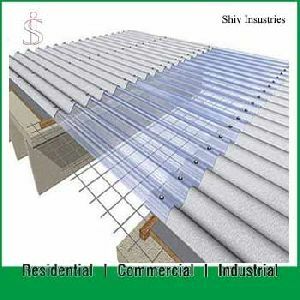 Particularly this Corrugated Polycarbonate Sheets is meant for lighting purpose and is used in Industrial, commercial and domestic areas. Basically taking into consideration the lighting problem and the demand of the Customers, the Company has made an attempt to resolve it and has produced Profile/ Corrugated Polycarbonate sheet especially meant for lighting purpose. The Profile of Sinus 76/18 sheet is specially made after taking into consideration the Profile size of G.I. Sheets duly manufactured by Big Producer Companies viz TATA and Jindal etc. so as to enable to match these in equality while installation.